Explore Valley Forge National Historic Park on this private, 4- or 6-hour driving tour from Philadelphia. This extraordinary park is the site of the 1777-78 winter encampment of the Continental Army in the Revolutionary War. A private guide will provide a pickup to begin the 30-minute trip to King of Prussia. The tour includes a drive around the park. See regimental monuments and recreations of the huts used by the troops who camped here and enjoy the opportunity to get out, explore, and take photos across the park. 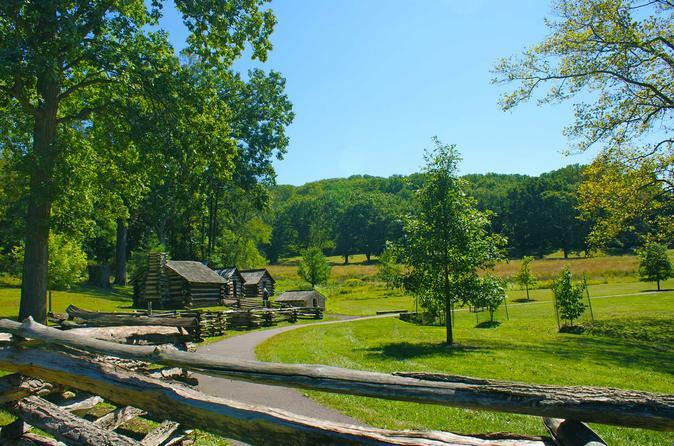 Spend a day away from the hustle of Philadelphia to visit Valley Forge National Historic Park in King of Prussia, PA. Depart Philly in the comfort of a private minivan, reaching the park in roughly 30 minutes, depending on traffic conditions. This tour includes a drive around the park to see regimental monuments and recreations of the huts used by the troops who camped there. Enjoy many opportunities to get out, explore, and take photos across the park. Visit the site of George Washington’s headquarters and the Washington Memorial Chapel, built in the early 1900s to commemorate this unique part of history. Throughout your drive, the guide will share stories and historical information. There will also be a chance to stop at the park's Visitor Center to watch a short movie about the encampment, browse the store, and visit the museum area before returning to Philadelphia.